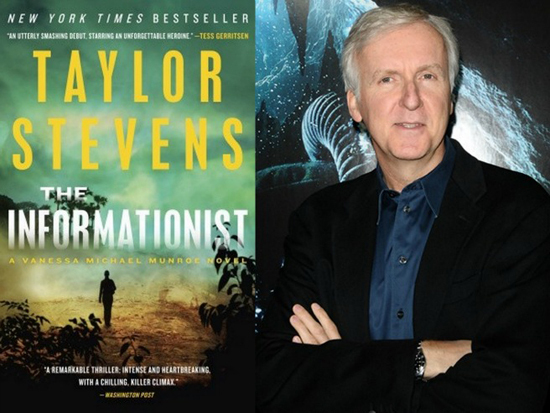 James Cameron Will Tackle 'THE INFORMATIONIST' After 'AVATAR' Sequels! Lightstorm Entertainment has stepped in & acquired the rights to Taylor Stevens's acclaimed 2011 novel The Informationist. The movie is planned as a vehicle for James Cameron to direct for 20th Century Fox. Cameron will adapt The Informationist after he completes work on the second & third Avatar installments, which are currently in pre-production. The novel centers on Vanessa "Michael" Munroe, an information specialist, whose work is in-demand by corporations, heads of state, private clients & anyone else who can pay for her unique brand of expertise. When a Texas oil billionaire hires her to find his daughter who vanished in Africa four years ago, Munroe finds herself back in the lands of her childhood. Betrayed, cut off from civilization & left for dead, she must come face-to-face with the past that she's tried for so long to forget. Cameron will produce with Jon Landau. Cameron stated: "Taylor Stevens' Vanessa Michael Munroe is an intriguing and compelling heroine with an agile mind and a thirst for adventure. Equally fascinating for me is her emotional life and her unexpected love story. I'm looking forward to bringing Vanessa and her world to the big screen." I'm reading: James Cameron Will Tackle 'THE INFORMATIONIST' After 'AVATAR' Sequels!Tweet this!